"In the words of @nytfood: "@brunopizzanyc serves a pie @Instagram loves." The chefs at the new #pizzeria in Manhattan's East Village mill their flour in the basement using whole New York State wheat berries. Then, they ferment it slowly with a sourdough starter. 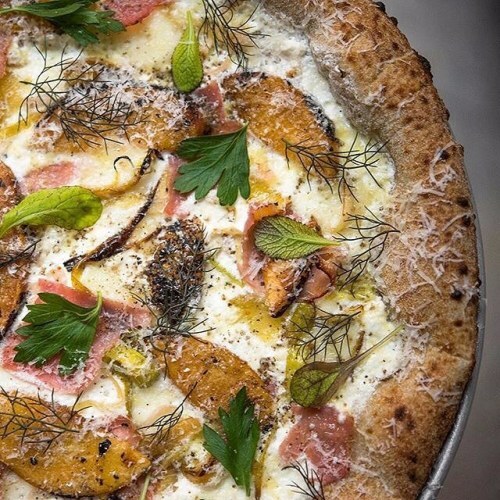 In this photo by @danielkrieger, blots of soft raw-milk cheese punctuate this #pizza topped with country ham and sliced peaches. Follow @nytfood to see more photos of #🍕 and other late-night snack options. #regram #pizzatime" By nytimes on Instagram.